Narcissistic. Narcissism. When you try this Baking with Julia galette recipe, you will be as the poor ol’ sap Narcissus when he fell in love with his own beauty. The neighbors will be asking, “Who’s that crazy chick/dude walking around with a galette?! ?” It’s you! You will be walking around the neighborhood with your piping hot galette. You will be offering it to all your neighbors and any other random person you encounter jogging by. You will announce it on Facebook to all your high school friends and cousins, “I made a Julia Child/Dorie Greenspan recipe and it rocked!” I am not kidding. It’s what I did! 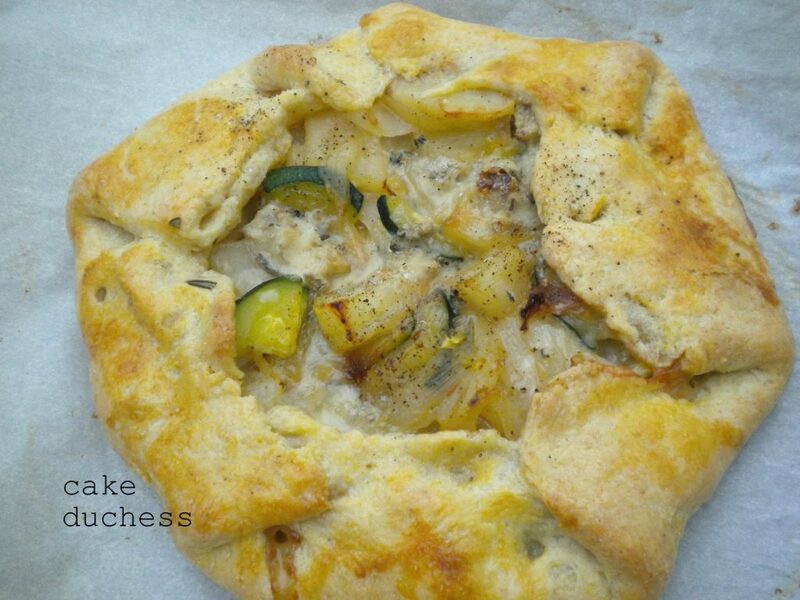 I made the galette dough and filled it with some of my favorites: potatoes, onions, zucchini, and gorgonzola. You can substitute the gorgonzola for any other cheese. I happened to have some and have been waiting for an idea like this to hit me to use it in. The caramelized onions are sweet and go so well with the potatoes and zucchini. The gorgonzola adds just the right amount of saltiness. The gorgonzola could overpower the recipe, but it doesn’t because you only use a small amount. Now if you have carpal tunnel syndrome from tweeting and texting all day, you may have a problem with making this dough by hand. Just deal with the pain, and make it the way Julia Child used to. Here is how you make the dough. (I doubled the recipe and impressed some people that came over for pizza last night and also made my Savory Galette for them. Sometimes I show off like that. )The extra dough will keep in the refrigerator for a few days. Remove the dough, divide it in half (for 1-2 servings, or wrap it as one for 3-4 servings). I did double the recipe and made another one the next day. Squish the ball down flat and wrap it in plastic and chill for at least 2 hours. You could also work with the dough the next day as I did and it will be great. Heat the olive oil in a medium satue’ pan over medium-high heat. Add the onion and cook until soft and lightly colored (about 10 minutes). Be sure to stir the onions occasionally. Add the sliced potatoes, zucchini, and rosemary (or thyme), salt, and some crushed pepper. Cook for about another 7 minutes. Remove from the heat onto a plate and let the filling cool before assembling it in the galette. Preheat your oven to 400 F. Combine the cooled filling ingredients with the gorgonzola crumbles in a bowl. Mound the filling in the center of the galette, and leave a 1 1/2 inch border around the edge. Fold the border around the filling and make cute pleats. Leave the center open. Drizzle a tablespoon of olive oil on the top and sprinkle with a little salt and pepper. Brush the pleated dough with the beaten egg. Bake it for about 40-50 minutes until it is golden brown. The bottom crush should be a nice golden color. Enjoy! Thank you Shea!It was truly amazing! :) Thanks for visiting my blog! Mmmm, I love the addition of gorgonzola! So pretty…I love rustic tarts. The flavors in this are wonderful, especially the gorgonzola! Yum! This looks delicious.. a perfect Fall meal.. I would totally walk down the street with this in hand! Great post, and I can't wait to make this! Anything with cheese and caramelized onions, I am sold! I'll hold off and make this for dinner. If I prepare it for lunch, I'll eat the whole thing! Ha! Yes after a day on twitter my right hand is numb but making this will bring everything back to life. I told you on twitter (he he) that this is just what I want to make and eat! I love the zucchini-gorgonzola pairing and caramelized onions just make everything taste better. This is on my to-make list! This is my kind of galette. I love the sweet ones, but I'm a huge onion and zucchini person and to wrap it all in pastry hits me right in the heart. Thanks for sharing this! I would love to make this recipe but I'm unsure about the amount of zucchini to use. I don't see it listed in the ingredients list and I'd hate to make a wrong guess on something like this. It looks so very good! Not only am I walking away with a bit more mythology stored in my brain…but I'm also walking away with a beautiful recipe that would be sure to please me (and a crowd!) I adore making savory galettes, and I imagine that this would be a lovely addition to any fall meal. How did I miss this? Definitely my cup of tea! I have savory tooth, Lora! Two questions: 1) self rising or plain cornmeal? 2)Did you use all purpose flour or a different kind?